Police kidnapped Indian youths who then disappears in thin air a la Bangsar Shan. Last week we received a distress call from a Hindraf/HRP supporters that a group of UMNO Malay-sian Polis Raja Di Malay-sia members had arrested a group of for Indian youths who were having drink at a café. The next day the blood stained car was found and the lift lobby splattered with blood. And now these Indian youths have just disappeared in thin air despite their families having lodged a police report. Crime rate coming down in Malay-sia? 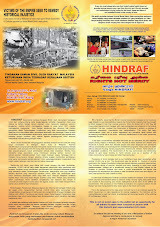 Racist UMNO DBKL: Why only relocate “ethnically cleanse” Cochrane Hindu temple. Why not relocate suraus and masjids as well in One Malay-sia? Why pick on Hindu temples and that too for a mere temporary relocation and only to be demolished anyway in due course! This is despite the Federal Territory Ministry giving a parliamentary undertaking that no more Hindu temples would be demolished anymore. But the racist UMNO implementation is another thing all together. And the use of the MIC Deputy Minister Indian mandore to do this UMNO dirty job. Why can’t all Hindu temples like any other masjids and surau in One Malay-sia be granted permanent land and permanent status and thereby a permanent solution? As opposed to this racist UMNO temporary relocation solution with the view to be ultimately “ethnically cleansed”. CRIMES AGAINST HUMANITY IN MALAYSIA trial at International Criminal Court in The Hague? Arrest P.M Najib Razak on overseas travel! – Dr. Raj Ghandhi, USA. In this day and age it is hard to imagine a natural born child being denied a birth certificate and citizenship of a country of his/her birth. But that is exactly what happens to a Hindu child born in Malaysia. The State refuses to issue the birth certificate and keeps on finding useless and flimsy excuses. The child grows up to school age, and school refuses admission because the child does not have the birth certificate. Muslim children do not face this problem. I was aware of some discrimination against Hindus in Malaysia who form about 7% of the population. I did not know about the wanton nature of this discrimination until I attended a lecture – presentation by Waytha Moorthy at the Global Mall in Atlanta, Georgia on the evening of 1st April, 2011, thanks to the India Awareness Foundation. My wife and I, along with everyone else in the audience were appalled with what we saw and heard that evening. How can a nation deny fundamental human rights to its own natural born citizens based on religion, and harass, physically abuse, imprison and torture them if they try to assemble peacefully and legally for a legitimate cause? On what basis does the government of Malaysia justify demolition of old Hindu temples which have been there for centuries? On what basis does it deny Hindus their right to worship and build temples? Obviously the government of Malaysia is engaged in the practice of religious discrimination and criminal oppression of Hindu minorities. In my view the Prime Minister and the King of Malaysia must be tried for crimes against humanity in the International Criminal Court in The Hague or any other court of law, if possible. Having been successfully tried and convicted, they will become pariah in the eyes of many nations and will face the risk of possible arrest during their international travel. The publicity created by all this will be a bonus and act as a legitimate pressure on the government of Malaysia to bring about necessary reforms and restore fundamental human rights to its Hindu minorities. If no court of law is available, their crimes must be exposed fully so that they face trial in the court of public opinion. Human Rights Watch and Amnesty International should take a leading role in this matter. I admire and condone the efforts of Waytha Moorthy and others who have taken the worthy cause of fighting for their civil rights and the civil rights of fellow citizens who are being discriminated and mistreated by the government authorities. I urge the UNO and its member states to offer all possible help in this matter. I also urge the US government to exercise its political and moral authority to bring the necessary pressure to bear on the government of Malaysia to ensure long awaited civil right reforms for its minorities. For my part, I wish Waytha Moorthy et al good luck and give them my best to succeed in this struggle. I also pray God to give Malaysian rulers some wisdom, sense of justice and fairness, and an element of conscience so that they may treat all their citizens equally, without any form of discrimination. Indian's and their struggles - AM I AN INDIAN ????? Being an Indian is like an disadvantage in Malaysia ... the struggles each Indian goes through each day is unbearable . Be it a professional or a laborer, we see that many obsticals and challenges we face in carrying out daily routines. We see many Indian people and hear many suffering here and there BUT not many willing to help . Forget about other races but even an Indian just make don't know when it is highlighted to them .. The feelings of One race and brotherhood doesn't much exist in our Indian Blood nowadays. More Indian's are living in this country taking care of their own life's, their work, their finances and their children and their wife only. they seems not bothered whats happening to another Indian's plight ... I wonder why these happening here ???? I might be wrong and correct me if i am .. I think that we are becoming selfish people and the heart of sharing, caring , loving is slowly dying in our Indian community nowadays. Indian's used to be the most caring and helpful people at one time no matter what the religion of his neighbor, he will the first to give his assistance to them. But today, all this have diminished in thin air.. The mentality of such people is seen nowadays and only when a problem or a issue that doesn't favour them comes emerging then only they start looking for Indians for help ... Many Indians in middle class statues are living in such denial ..BUT when his or her kids whom performed well getting 10A in SPm examination for instance and refused a place of a seat in university then they come out to make noises blaming other people. They blame the indian parties or leaders for not doing thier job ... BUT in fact from the beginning they are not bothered when they hear another Indian kid who also did well in SPM refused a place in the University. That's how it is with our people ... when a crisis hit hard and that's where they look for support from other Indians... before that they are not bothered whether to lift their fingers to help another poor Indians. GOD is great ... that's why i believe ... He wanted this kinda of people to learn the lesson from happenings in their own family. I believe all of us will go through this one day and we face the consequences when we are turned down by the authorities even tho our kids deserved a rightful place in university . to poor oil into the fire , GOD will show them (including me) that moment of our frustration , seeing a malay guy with only 4A get a place in the same university that we were turned away . How would we feel at that moment of time ???? 2. The Interlok issue - Many of us Indian's didn't like how the education panel together with Dewan Bahasa used words that have offended many Indian's in Malaysia. We have about few million Indian's in Malaysia (including me) just kept quiet and it became a coffee shop talk only ...banging tables and shouting about it .. How many of us took concrete steps to protest on the interlok issue ... We Indian's didn't even lift a finger to address the issue , so are our so called Indian MP'S . If these Indian MP's no matter which parties they belong to ..just staged a walk out on these issue ..i would salute them but no one did that BUT when Dato Anwar was suspended from the parliament many Pakatan MP's followed him and walk out of parliament .... ARE THESE INDIAN POLITICIAN'S JUST NAME SAME POLITICIAN FOR INDIAN'S IN MALAYSIA.... IS IT ???? Where are they belongings to .... to the Indian people who voted for them or their leader who was suspended ???? The same goes to the MIC leaders too. Where were each one of us when this issue was a hot problem concerning our Indian children and our community . Why didn't we stand for our rights then ,,, why did we chicken out .... so afraid that our livelihood would be effected.. am i right is saying this ???? Have we ever in our place of residing see such capable poor indian lady and help her to put up a vadai stall or a chapati stall .... No i guess,,,, We don't care actually ... that's our reasoning ... Why can't we Indian's get to gather in our area and help such people to do business.... Is it to much to ask of us ???? a) Why can't protest what our kid's deprived of ...the basic education ? b) Why can;t we staged a rally for Indian kids who are deprived ... your kids and mine too ...We all know that without proper a 1st degree our kids are not heading anywhere. c) Stage a protest by not going to work perhaps .... close all indian shops for this purpose .... bring down the economic stand still .... teachers refuse to attend school, lawyer and doctor take the day off .... and we all meet for a picnic in Lake gardens . Won't that sent a strong message to the government . I am not condemning us BUT i am highlighting the problems our Indian brothers and sisters facing all around Malaysia ... making us realize that we too have to play our part in building our Indian community ...No matter you are a lawyer, doctor, professionals, restoran owners, a civil servant , a laborer, a policeman, a fish monger or any job we are doing .... We have to get united by building our Indian communities in our residing areas, our city, our township and our nation as large. Fight racism within ourselves first before we go out there... facing other races and the government for our rights to be given to us as we deserved. We are not asking for heaven , all we asking is for a decent livelihood to make a living and basic necessity. We too worked and pay taxes so we too deserve to be served in a proper manner as a human . Look at leaders who fight for indians, who dare to stand and demand the government to give Indian our rights deemed, leaders who are in and out of jail for the cause of another Indian .... Willing leaders to champion poor Indian issues like land issue, University Seats, Burial grounds, employment , basic necessities like welfare for poor deserving Indians, temples , churches , education and elevating the standard of living for youths and young Indian boy's and girls. WHO ARE THE LEADERS FIGHTING FOR ALL THIS NOWADAYS SINCE 2007 ???? WHO ARE THE LEADERS DEMANDING ALL THESE FOR INDIANS TODAY??? Ask yourselves brothers and sisters ...and the answer in within your heart .